Overweight and obese people have an increased incidence of heart disease, and thus fall victim to heart attack, congestive heart failure, sudden cardiac death, angina, and abnormal heart rhythm more often than those that maintain a healthy body mass index. Obesity often increases the risk of heart disease because of its negative effect on blood lipid levels, which increase in obese patients and then, in turn, increase triglyceride levels and decrease high-density lipoprotein – which is also known as HDL or “good cholesterol.”The heart and blood flow is the number one affected system when one is overweight. There is the congenital heart failure where the blood finds it difficult to pump blood. This is usually because of excess fats or plaque that gets stuck on the artery or vein walls. There is also enlargement of heart due to thickening of the heart muscle. Then a pulmonary embolism may also become a health problem. This is when the pulmonary artery gets blocked due to fat, amniotic fluid, or blood clot. All these pose risks to stroke or sudden death. Type 2 Diabetes. 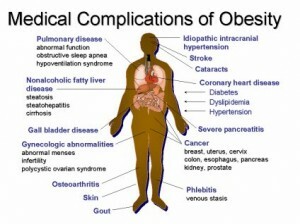 Obese people are also vulnerable to type II diabetes. This type of diabetes is called as non insulin dependent diabetes. Resistance to the hormone insulin is also caused due to obesity. Due to this only (insulin resistance) the person turns to be a diabetic (type II). Infertility. Being obese can cause changes in the hormonal levels of women, which can result in ovarian failure. Women who are 15-25 pounds overweight are at a higher risk of suffering from infertility and ovarian cancer. Our bodies need to be at an appropriate weight to produce the right amount of hormones and regulate ovulation and menstruation. Don’t think men are immune to infertility. 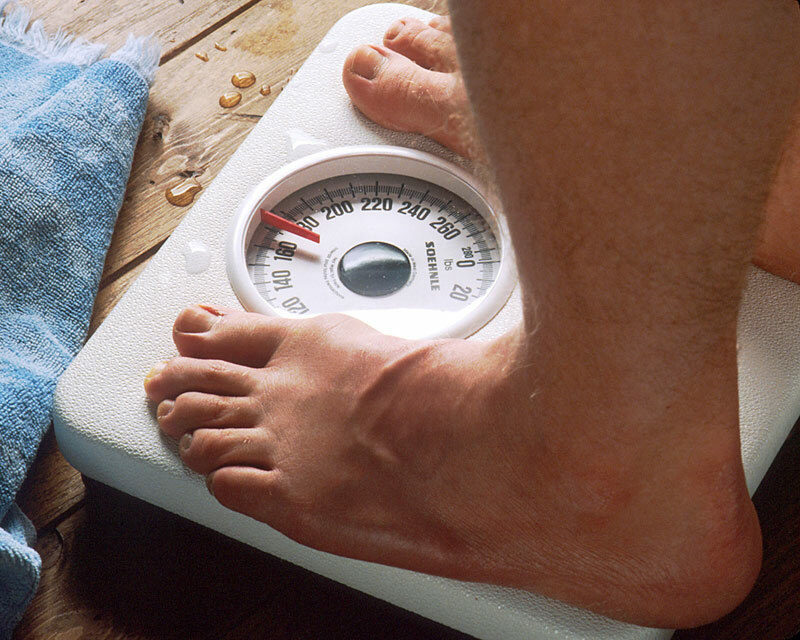 Overweight men have a greater chance of developing motility and a lower sperm count. Shedding 12-14 pounds can help you lower the risks. Cancers (Endometrial, Breast and Colon). Obese patients are more vulnerable to cancer. Obese female patients suffering from breast cancer, uterine cancer and the risk of cervical cancer has increased by 3 times the risk of endometrial cancer risk by 7 times. Obese male patient suffering from colon cancer and prostate cancer risk also increased significantly. Hypertension (High Blood Pressure). Blood pressure is the force of blood pushing against the walls of the arteries as the heart pumps out blood. Hypertension, or high blood pressure, greatly raises your risk of heart attack, stroke or kidney failure. Being overweight or obese increases the risk of developing high blood pressure. In fact, blood pressure rises as body weight increases. Losing even 10 pounds can lower blood pressure—and losing weight has the biggest effect on those who are overweight and already have hypertension. Stroke. There is a link between obesity and stroke; this is particularly the case for people whose fat is situated predominantly in the abdominal region. Overweight people are more likely to have high blood cholesterol levels and high blood pressure, but these associations are not the only explanations for the greater stroke rate. Liver Disease. It is difficult for the body to deal with obesity, because rich foods usually do not get distributed appropriately. When this is the case, fat can build up around the liver, which may result in its inflammation, scarring, and even permanent damage. Gallbladder Disease. Gallstones form when bile, liquid that help the body digest fats, that is stored in the gallbladder hardens into pieces of stone-like material. It happens when bile contains too much cholesterol. Sleep Apnea and Respiratory Problems. Obesity is known to be a common cause of sleep apnea. In this condition, breathing starts and stops during sleep. It causes a person to wake up frequently during the night. Without a good night’s rest, the person may suffer fatigue and sleepiness during the day. Osteoarthritis. It is caused by degeneration of cartilage and its underlying bone within a joint. Disease can cause pain and discomfort to the joints and can inhibit movement. Psychological and Social Outcomes. Overweight people often face discrimination at work and in social settings. Feelings of rejection, shame, or depression aren’t uncommon. Also our society equates thinness with attractiveness.